Step into a freaky dystopian future of war and domestic crowd control with the new Lockheed Martin weaponized laser. 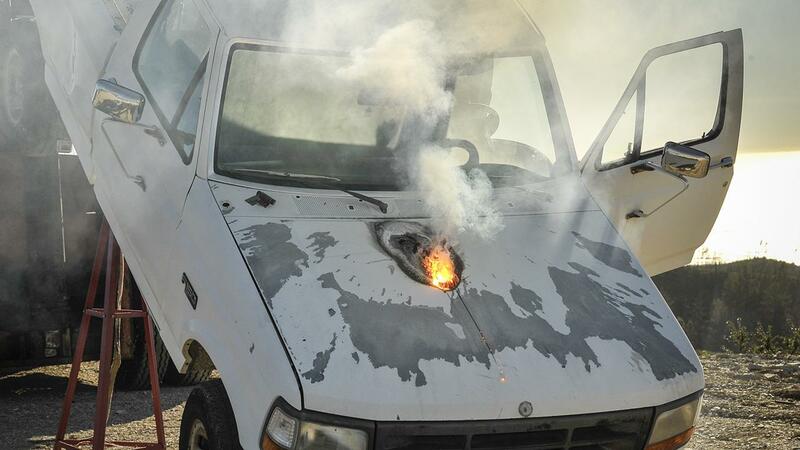 The field test was declared a “success” after the 30-kW fiber laser system focused on the engine block of a small truck mounted to a platform. The truck went from a running engine and drivetrain to cmplete garbage after just a few seconds of laser fire. Lockheed’s really into acronyms, and the Advanced Test High Energy Asset (ATHENA) is the name of the prototype, which is basically a ground-based single-mode laser. That means it is simple enough to just point and shoot. ATHENA is part of Lockheed Martin’s Area Defense Anti-Munitions (ADAM) system. ATHENA also incorporates the 30-kW Accelerated Laser Demonstration Initiative (ALaDIn) which is a proprietary, fiber laser made only by Lockheed. ATHENA superheats targets by a method called Spectrum Beam Combining. Even though it’s 2015, lasers have been notoriously difficult to turn into a practical weapon because the obscene power requirements and overall cumbersome nature of charging and discharging. A previous Lockheed attempt at a laser tested decently, wrecking a small boat in a demonstration earlier in the decade. So, what the heck is “Spectrum Beam Combining”? It’s a process that can overcome previous limitations because it uses fiber laser modules, which is how it activates a gain medium consisting of optical fiber treated with a rare-earth element. Variations have used erbium, ytterbium, neodymium, among others. Fiber optics are both flexible and of variable length without changing the consistency of the light; the laser chamber can be thousands of meters long so the fiber optics solved a huge limitation by allowing the device to actually be coiled like a snake. Another big problem that has gone the way of the past because of the fiber configuration: higher surface-to-volume ratio that allows quicker cooling after initial use. Fiber lasers are extremely durable compared to previous attempts. They also are able to project a high-quality, destructive beam that only uses 50 percent of the electricity that solid-state lasers have in the past. Will this device be able to live up to the 1980’s dream of Reagan’s Star Wars Missile Defense Network? Breaking Defense was able to interview Lockheed senior fellow Rob Afzal, who said the laser is hindered by economic conditions more than technological development and that a 500-kW laser is around the corner, being able to take out a cruise missile.